High-fructose corn syrup (HFCS) might be the ultimate anti-Paleo food. It’s basically sugar, but made from industrially processed grains, so it’s knocking out two junk-food categories in one sickly-sweet swoop. It’s very common to blame high-fructose corn syrup for problems like obesity and fatty liver disease, but a lot of that criticism is actually misplaced. It’s not that high-fructose corn syrup is actually good for you; it’s that people miss the point when they attack HFCS and ignore other kinds of sugar. Here’s a look past the media spin (from both sides! ), with 5 things you should know before you criticize HFCS. 1. It has Less Fructose than you (Probably) Think. 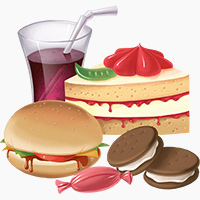 Food chemistry review: glucose and fructose are both types of simple sugar. Carbohydrates are made from various combinations of simple sugars. For example, table sugar has 1 part glucose to 1 part fructose, so it has a perfectly equal amount of each. Fructose gets a lot of well-deserved Paleo criticism for contributing to liver disease and obesity. And it’s true that fructose may cause more health problems than glucose – the point here isn’t that fructose is innocent. It’s that HFCS doesn’t have any more fructose than regular sugar. HFCS-42: 42% fructose, used mostly in foods like cereal and cookies. HFCS-55: 55% fructose, used mostly in soft drinks. That’s basically the same as table sugar, which is 50% fructose. If HFCS causes health problems by adding sugar to the American diet, then it’s really no better or worse on that count than table sugar. HFCS didn’t cause problems by displacing table sugar, and replacing HFCS with table sugar won’t be a solution. 2. It Might Contribute to Obesity, but Not Directly (and the Lobbying is Crazy). HFCS isn’t any worse in theory than sugar, but it comes in forms that are very easy to overeat. Studies on HFCS overwhelmingly find that it’s not significantly more or less fattening than any other kind of sugar. This is exactly what you’d expect, considering that it’s chemically almost identical to sugar. Sugar under one name has the same effect as sugar under another name: huge surprise! But different interest groups spin the exact same results different ways. The pro-HFCS lobby includes the beverage industry (it’s a major ingredient in Coke, etc. because it’s very cheap), the junk-food industry in general, and the Corn Refiners Association, which is the corn industry lobbying group. People on this side like to claim that since HFCS isn’t any worse than any other kind of sugar, there’s no problem with it and it doesn’t contribute to obesity. But the industry folks don’t like to discuss how high-fructose corn syrup makes it much easier to consume a lot more sugar very cheaply. Just over half of added sugars in the US diet and 8% of total calories come from HFCS. If we banished the stuff tomorrow, people would probably replace some of it with sugar, but not all, if only because sugar is so much more expensive. It’s pretty obvious to anyone but a pro-HFCS lobbyist that HFCS actually does contribute to obesity. But it’s not because HFCS is particularly or uniquely fattening. It’s because HFCS makes sugar so much easier and cheaper to overconsume. 3. “Fruit Sugar,” “Organic Cane Sugar,” etc. are not Better for You. Soda and junk food companies are aware that a lot of people are leery of HFCS. 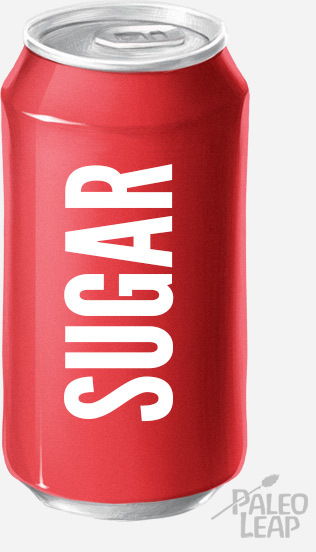 So they’re starting to make reformulated products with “real” sugar (think Mountain Dew Throwback, or Mexican Coke). Other companies that try to brand junk food as “natural” like to dress up “sugar” as “fruit sugar” or “organic cane sugar” or whatever other euphemism they can dream up to make it sound less like sugar. And there’s actually evidence that this works on people: adding the word “fruit” makes people think the sugar isn’t so bad. In fact, The Corn Refiners Association even tried to get in on this game by changing the name of HFCS to “corn sugar” to make it sound more natural, but the FDA rejected the petition. All of this is nonsense, because all of these products are essentially the same thing. HFCS is between 42% and 55% fructose. Sugar (“fruit sugar” or otherwise; it’s the exact same product no matter what you call it) is 50% fructose. Studies comparing high-fructose corn syrup to ordinary sugar have found that their metabolic effects are basically the same. As far as their metabolic effects are concerned, those all-natural organic cane sugar gummy bears might as well be made with HFCS. It might be true that fructose is particularly dangerous to health, but if that’s true, then sugar and HFCS are basically equally guilty of adding it to the American diet, because they both have the same amount of fructose. Don’t get sucked in by cheap marketing tricks; you’re smarter than that. 4. It might be in your honey. We’ve covered before how honey is one of the most frequently contaminated or fraudulent foods on the grocery store shelf. The real product is expensive and difficult to get. The fake stuff is cheap and easy to get, and relatively hard for consumers to detect without a lab test. It’s the perfect product for all kinds of fraud. HFCS is one of the most common honey contaminants because it has a similar consistency and taste. This doesn’t actually change the sugar composition much. Honey and HFCS have similar ratios of fructose to glucose. But if you’re getting local honey for the allergy-related benefits of the pollen, then HFCS obviously isn’t going to do the trick. And besides, just on the principle of the thing, if you’re paying for honey you want to get honey, not HFCS packaged in a little bear. You can avoid this by buying honey from a local beekeeper that you trust. 5. 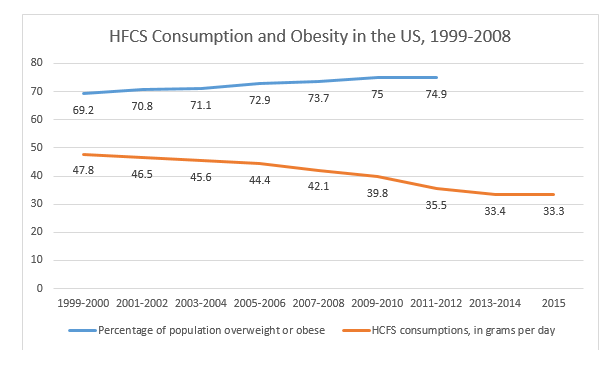 Consumption of HFCS is Falling as Obesity Rates Rise. Data for overweight/obesity percentages from the CDC; data for sugar consumption from the USDA. Overweight/obesity is not available for 2013 and later because data is from the NHANES survey, which is very accurate but results take a while to come out. Percentage of people overweight or obese in the general population is rising as HFCS consumption falls. If HFCS “caused” the so-called “obesity epidemic,” this wouldn’t be happening. Obesity is a lot more complicated than one food or nutrient, no matter how much we might want a simple answer. This isn’t a defense of HFCS. Nobody is arguing that HFCS is good for you, and this was not a sponsored post by the Corn Refiners Association, so hold the conspiracy theories. The point is just that if you’re going to argue against eating a food, you should actually know what the food is like. The problem with HFCS isn’t that it’s different from sugar; it’s that it is sugar, in a very cheap, endlessly available, easy-to-overeat form. It might be contributing to increasing rates of obesity, but it probably isn’t causing them, considering that HFCS intake has gone down recently as obesity has gone up. Know what you’re attacking before you attack it. Did you learn anything new about HFCS? Let us know on Facebook or Twitter!